Imagine relaxing after a long day in the comfort of your own in-home sauna. Believe it or not, but it can also help you get the rest you need and deserve. Here’s how to sleep better with a sauna at home. When cell phones, television, email and more prevent you from relaxing, a sauna can help. In just a few minutes, the quiet, environment allows body and mind to recharge and unravel from the day in preparation for a deep, peaceful sleep. One reason people can’t sleep can be their aches and pains; using a sauna before bed can ease pain. Elevated, sustained heat penetrates deep into muscle tissue for instant and lasting relief. With pain at bay, it’s easy to drift off for a deep, regenerative sleep. So Go Ahead, Take a Sauna, You Deserve it! 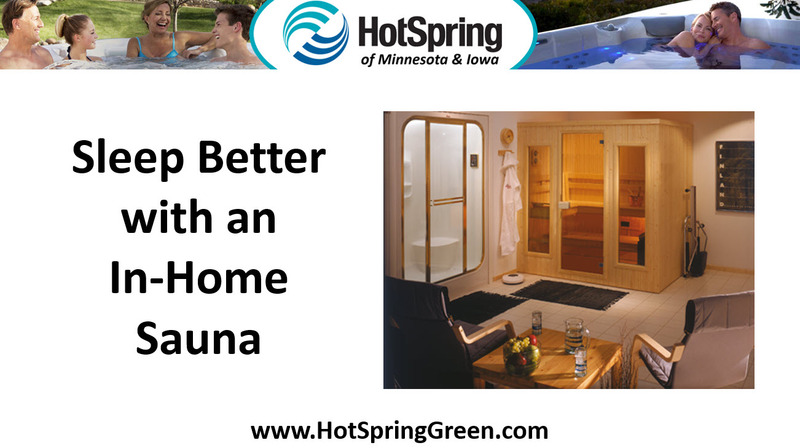 To encourage local residents to check out the benefits of using a sauna to help improve their overall health and well-being, Hot Spring Spas is providing free sauna test soaks. We do recommend, however, that people wanting to schedule their free 30-minute test call us ahead of time to reserve their spot. or visit our website at: https://hotspringgreen.com/all-guides/.